1. Cut a 4.25″ x 5.5″ folded card from the Kraft Cardstock and a 4″ x 5.25″ piece of white cardstock. 2. Stamp Easel with Memento Luxe Tuxedo Black and heat emboss with clear embossing powder. Stamp ‘Swirly Leafy Border’ along edge with Memento Luxe Pear Tart. 3. Mask off the ‘easel’ picture and lower 1/2 of the white cardstock and spray with Fireworks! Pear Tart. 4. Stamp ‘A Letter for You’ with Memento Luxe Sweet Plum and clear emboss. 5. Mask off area around easel and stamp ‘Dogwood Blossoms’ in picture frame with Memento Luxe Pear Tart and then stamp ‘M’ with Memento Luxe Sweet Plum. 6. Adhere white cardstock to Kraft card. To say I like RubberMoon Stamps is an understatement because I L-O-V-E them! They’re so quirky, so witty, and so unconventional. I was thrilled to learn that IMAGINE Crafts would be collaborating with RubberMoon Stamps this month. For my project, I decided to get creative with one of the RubberMoon clock kits. As I write this posting, the clock is working perfectly . . . the time is correct and the second-hand is rotating around the clock very nicely. My first real mechanical achievement! My personal thank you to RubberMoon for their generosity when supplying us with their stamps and Creative Clock Kit. The uniqueness of RubberMoon stamps really helps the creative process! Die cut the Vertigo with the largest circle nestability die. Be sure to use the metal adapter plate to ensure a clean cut. You may find that you might have to pass this through the die cutting machine several times depending on your die cutting machine. With an InkBlusher, dab StazOn Hydrangea Blue onto the backside of the Vertigo. Allow to dry, then apply a thin coating of the GlazOn* with an InkBlusher. Allow to dry. Dab on the StazOn in Blue Hawaii; allow to dry and then apply another thin coat of GlazOn. Allow to dry. Dab on the StazOn in Midnight Blue; allow to dry and apply another thin coat of GlazOn. Allow to dry. *GlazOn allows you to layer StazOn colors without color migration, allowing the integrity of each color to remain true. It also allows you to layer another color without also picking ‘up’ the previous color when the solvents in each react to each other. Apply a piece of Tack “n Peel to the backside of the unmounted sentiment stamp, and adhere to an acrylic stamp block. On the front side of the Vertigo, stamp the RubberMoon sentiment stamp in the center with the StazOn Opaque in Cotton White. Coat the base (top and sides) and clock face (front and back) with Memento in Pistachio to give them an underlying weathered look. Allow to dry. Coat both sides of the u-post with VersaFine in Majestic Blue. Allow to dry. Stamp the “I Love the Moon” sentiment stamp with the Red Satin around the edge of the circle, and stamp it in Majestic Blue around the center. After it has dried, spray with the clear GooseBumps and let dry. On the other side, stamp the sun face stamp in Majestic Blue around the perimeter of the clock (face side up) so there are stamped lines showing on the outside edge of the Vertigo. After it is dry, spray with the Shimmer Spray and allow to dry. 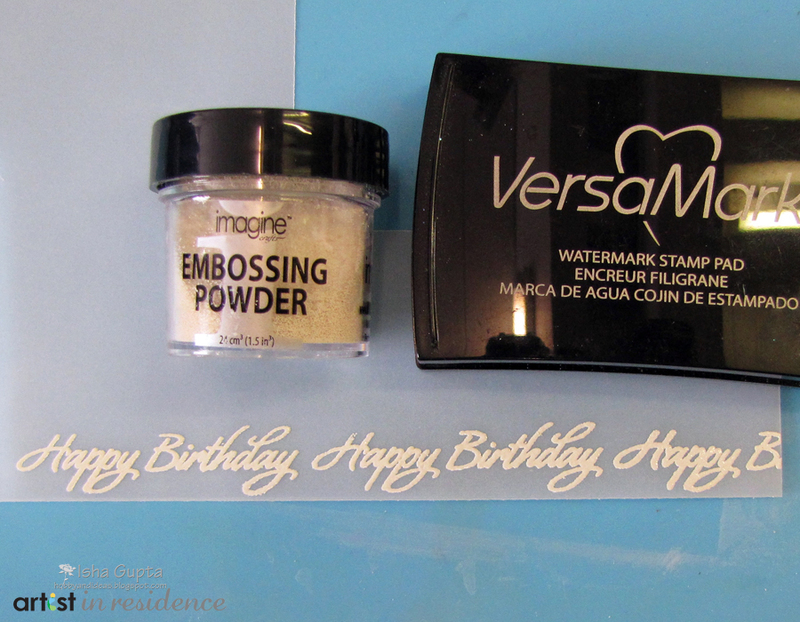 Apply VersaMark to the entire surface of the base, apply the Clear Embossing Powder and heat set. Do this twice. Then spray the base with the Danube Blue irRESISTible Craft Spray. Spray heavily in 2-3 areas and with a toothpick, draw the color out in all directions to form ‘legs’. Allow to completely dry. Coat the number ring with the VersaMark in Majestic Blue. Allow to dry. For an “icy” look, apply the Pico Embellisher in Wedding White along the lines of each number; allow to completely dry. Lay the Vertigo on top of the clock face, making sure to keep it in place when you turn the clock face over to the backside. Using the backside’s center hole, cut a center hole through the Vertigo with the Japanese hole punch. Make sure the hole is big enough to allow the white and yellow tip of the clock mechanism. Assemble the remaining pieces of the clock (hands, washer and hex nut). Glue the number ring around the Vertigo. Follow the remaining directions for the clock assembly that is in the kit, including inserting a AA battery into the clock mechanism. Set the hands to the correct time. Adhere an adhesive flat-backed crystal to each corner of the base. Enjoy your RubberMoon clock! Because of the Vertigo and depending upon the lighting, the clock face might appear as if it is floating in space. This week IMAGINE Crafts is proud to feature the fun and amazing stamps from Lawn Fawn! Our Artists In Residence are here all week to inspire you with their amazing projects using IMAGINE Crafts’ products along with rubber stamps from Lawn Fawn. Be sure to visit both company’s blogs daily for ideas, tips and techniques from our design teams. Cathy Andronicou is here to share with you this fun Holiday greeting card using Lawn Fawn stamps with Memento inks and markers. 1. Cut Curved Borders One with scrap paper. 2. Affix the curved border piece to white cardstock, sized 4 x 5 1/4 inches to the center using washi tape as shown. 3. Sponge Summer Sky ink above the curved border piece with a Sponge Dauber. Add ink along the bottom edge of the curved piece as well. 4. Sponge Danube Blue ink above the curved border piece, and leaving some of the Summer Sky ink showing (you are producing a gradient effect), with a Sponge Dauber. 5. Sponge Grape Jelly ink above the curved border piece, and leaving some Danube Blue and Summer Sky ink showing (you are producing a gradient effect), with a Sponge Dauber. 6. Stamp Lawn Fawn “Winter Penguin” onto lower portion of the cardstock with Tuxedo Black ink. Add the small heart stamp using London Fog ink. 7. Color the penguin with Memento Markers: Gray Flannel, Tangelo, Lulu Lavender and Summer Sky. 8. Add Creative Medium Shimmer to the bottom portion with a paint brush to create the icy pond. 9. Remove the curved border piece and add “snow” using irRESISTibles Wedding Dress Pico Embellisher. 10. Stamp sentiment on die cut and add to the panel, then glue panel to a card. Finish with a snowflake die cut. Lawn Fawn’s photopolymer clear stamps are exceptionally well made and worked wonderfully with the inks I used from IMAGINE Crafts/Tsukineko. I loved the characters and accompanying sentiments in the “Critters in the Attic” stamp set. 1. Using the Brilliance Peacock multi-colored inkpad, apply color onto the watercolor paper with an InkBlusher using the Prima stencil. Spray the paper with Ink Potion No. 9 to blend the colors a little. Allow to dry. 2. Stamp the walrus and “smile” sentiment onto the stenciled paper with VersaFine in Onxy Black. Stamp the walrus again onto white paper and cut out to use as a mask. 3. With removable adhesive, tape the walrus mask over the stamped walrus. Stamp the ice flow block so the walrus is sitting on it. Remove mask. 4. Color the ice flow block with the Brilliance in Pearlescent Sky Blue, VersaMagic Sea Breeze, Turquoise Gem and Niagara Mist using the Fantastix. 5. Color the walrus with Copic markers – use the Prussian Blue Copic Marker on the eyes, nose and outline of the tusks. 6. 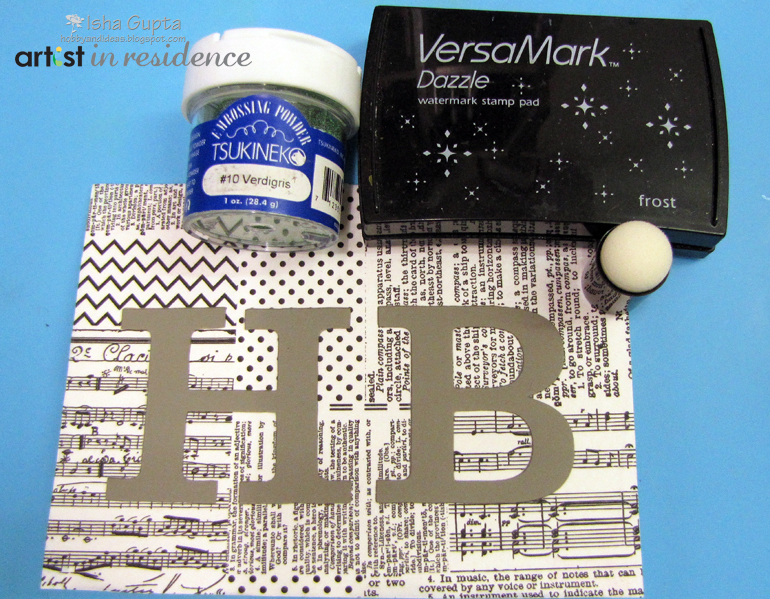 Stamp the sentiment “have an ice day” under images with VersaFine in Majestic Blue. 7. Spray the card stock with Goosebumps in Shimmer. Allow to dry. 8. Die cut the walrus image with the next-to-the-largest square die. Die cut black card stock with the largest square die. Cut the velvet paper into a 4-inch square. Die cut the center with the largest Label Twelve die so the 4-inch square can be used as a frame. 9. Adhere the stamped image to the black square die cut. Adhere this set to the base panel card stock from Authentique (4-3/4” square), offset a little to the right. Overlay the velvet frame die cut and adhere with 1/4” Scor Tape along the 4 edges, and glue dots on each inside corner. 10. Randomly adhere different sizes of light blue crystals on the left side of the card. If you have any left-over die cut pieces from another project that are appropriate, use them; in this case, a wheel and a very small circle die cut were used from a project using blue Mirricard card stock. 11. Place the tiny circle die as a “dot” to the “i” in smile; placed the wheel die cut around one of the crystals. 12. With the irRESISTible Pico Embellisher, make small white dots on top of some of the background stenciled dots for snow. Allow to dry. 1. Die cut large circle onto white cardstock. 2. Stamp images with Memento Luxe Rich Cocoa and allow to dry. 3. Color in the cup with a blue colored pencils, using a darker color on the sides of the cup to highlight. 4. Use a VersaMarker to blend your colors together. 5. Continue coloring the bottom of the card to create a table, blending colors using a VersaMarker. 6. Die cut larger circle layering piece from black cardstock using the scalloped circles die. Adhere colored panel on top with dimensional adhesive. 7. Randomly stamp candy canes with Memento Luxe Love Letter and fill in with colored pencils onto white cardstock. 8. Cut/score square card base from blue cardstock. Cut a smaller layer of red cardstock, and trim the candy cane layer smaller to fit inside of the red layer. 9. Add dots with the irresistible Pico Embellisher in Wedding Dress around the border on the red layering piece. Alternate the size of the dots. 10. Assemble card as shown. This week IMAGINE Crafts is proud to feature the products from Hazel & Ruby. Our Artists In Residence are here all week to inspire you with their amazing projects using IMAGINE Crafts’ products along with a selection of stencils, paper and embellishments from Hazel & Ruby. 1. Make card from cardstock. 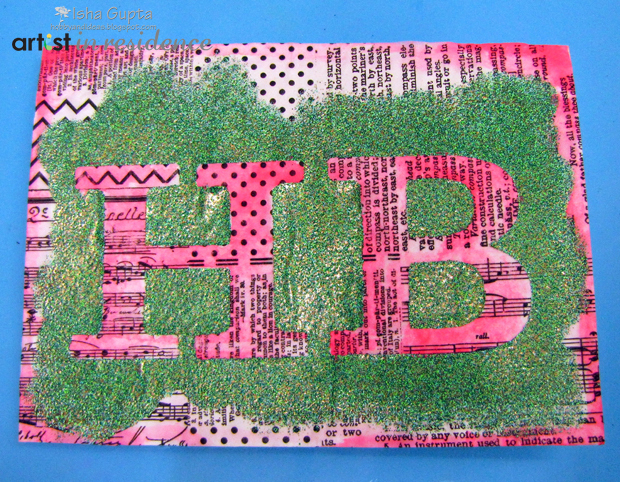 Apply creative medium onto the full card front using mini squeegee and adhere the tissue paper. Let it dry. 2. Mask using the stencil and apply VersaMark ink around the stencil using a finger dauber. 3. Apply Verdigris embossing powder and heat emboss. 4. Once cool, remove the stencil. 5. Put a drop of re-inker onto a acrylic block. Use water and color in the the non-embossed areas. 6. It would look like this. Let it dry. 7. 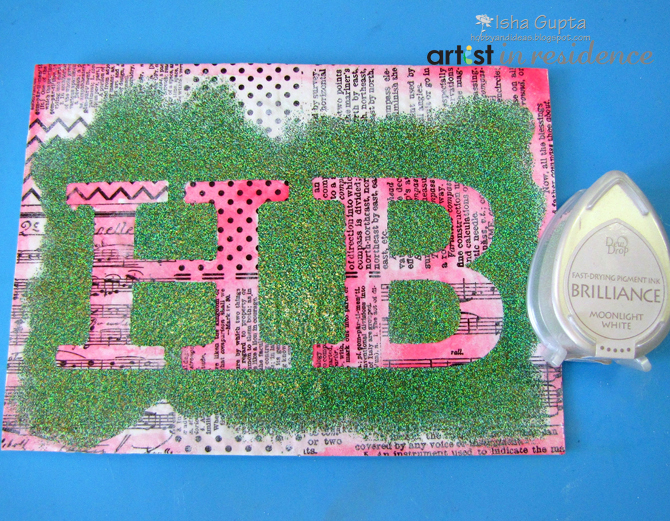 Apply some Brilliance white ink to soften the edges of the embossing powder. 8. Stamp and emboss the sentiment onto a strip of vellum and adhere to the card. To finish adhere some sequins too. 1. Cut two pieces of black chipboard, 6” square. 2. 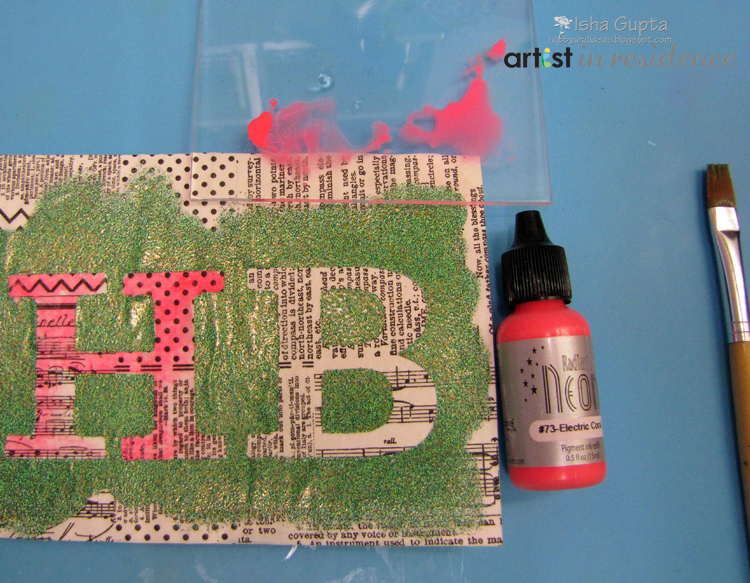 Adhere the text print designed tissue paper to Bazzill card stock with Creative Medium; spread the Creative Medium on the entire piece of card stock, adhere the tissue paper, and apply another layer of Creative Medium on top of the tissue paper. Allow to completely dry. Trim to 5-3/4” square. 3. Color the tissue paper with StazOn Midi’s in Emerald City leaving open spaces; allow to dry. Apply GlazOn over the entire surface and allow to dry. Add StazOn in Blue Hawaii, leaving a few small open spots; allow to dry. Apply GlazOn over the entire surface and allow to dry. Add StazOn in Spiced Chai and allow to dry. Apply a finishing coat of GlazOn over the entire surface and allow to completely dry. 4. With the largest square die, cut a square out of the center to make a frame. 5. Stamp the image with VersaMark onto the bronze card stock (5” square) and emboss with the silver embossing powder. Adhere to the backside of the frame so only the image shows through. 6. Adhere another piece of Bazzill card stock, trimmed to 5-7/8” square, to the black chipboard 6” square slightly off-set at an angle (see photo of completed cover). Then adhere the framed piece on top, again at a slight angled offset. 7. Spray the entire piece with the GooseBumps. While spraying, concentrate the spray in one spot to adhere the velvet floral and wire clip/charm embellishments, as well as the acrylic flower blossoms. Once they’re adhered, do another quick spray of GooseBumps all over. Allow to completely dry. Adhere the sequins with mini zots to the center of the acrylic blossoms and three spots along the left side of the frame opening. 8. With the second piece of black chipboard to be used as the back cover, spray the outside back with Fireworks! and allow to completely dry. Then place a scrap of decorated paper to the inside of the back cover that is trimmed to 5-15/16” square. 9. Cut several pieces of the white card stock to 11” long by 5-3/4” for the inside pages. 10. Along the long side, score at 5-3/4”. Flip the card stock over with the score line to the right, and score 1/4” from the left side. These pages will form the z-fold pages for the inside of the book. 11. Fold along the score lines. The “hill” of the score line goes to the inside of the fold. You will fold the 5-3/4” score line in one direction; and you will fold the 1/4” score line in the other direction so the “hill” or “bump” remains inside the fold. 12. Place your pages together. The outer unscored edge will tuck inside the scored edge of the next page to form the z-fold line of book pages. Place 1/4” red line adhesive tape or Scor Tape along the bottom edge of the unscored edge that will fit against the 1/4” folded edge of the next page. Press into place with your bone folder. 13. After the pages are put together, center and adhere to the inside of the front and back cover. Welcome to a week of fabulous projects featuring the great products from Memory Box! Our Artists In Residence were beyond excited to work with stamps and dies from our neighbor here in the Seattle area. 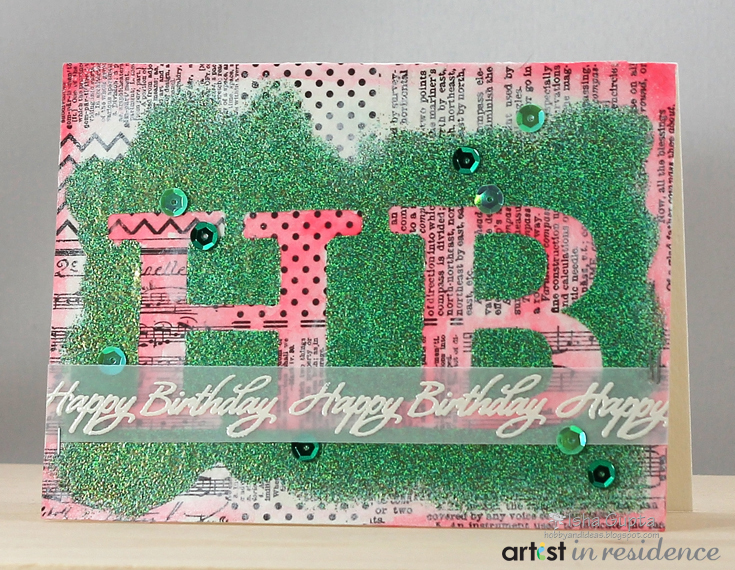 Today we share with you three more creations from our AIRs using IMAGINE Crafts products along with some of the newest offerings from Memory Box. 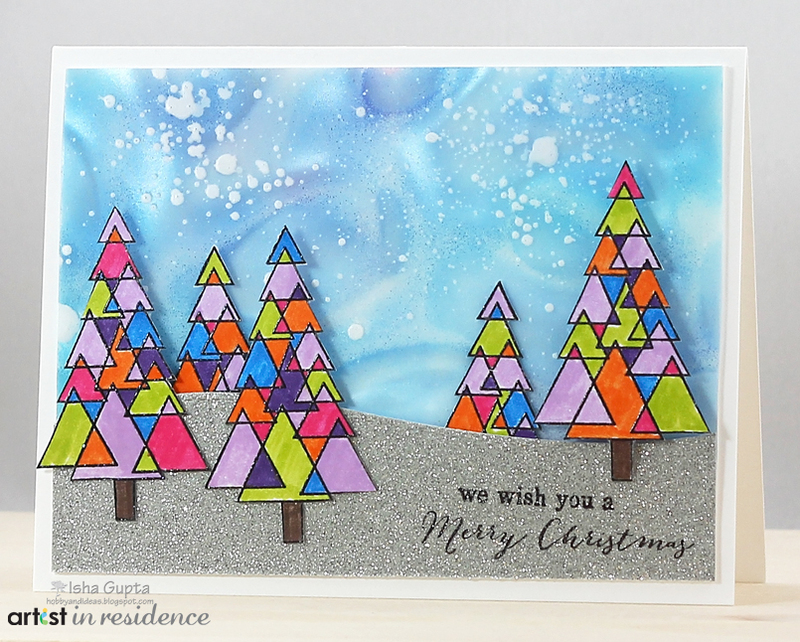 Savannah O’Gwynn shares with you in this video tutorial this simple and fabulous holiday card which includes stamping on acetate with StazOn inks. 1. Cut a piece of Vertigo film measuring 4˝ x 5 1/4˝ inches. 2. With a Sponge Dauber, color the back of the film first with Brilliance Pearlescent Sky Blue and Pearlescent Orchid; allow to dry completely. 3. Once dry, highlight with Memento Danube Blue. NOTE: by adding the Brilliance pigment ink first, you’re giving a “tooth” to the Vertigo for the Memento dye ink to adhere. 4. Turn the Vertigo film over and spritz with irRESISTible Wedding Dress texture spray to achieve a snow fall effect. Allow to dry. 5. Ink the Triangle Tree stamp using Versafine ink. Stamp and heat emboss using Iridescent embossing powder. 6. Color in the triangles using various colors of Memento Markers to achieve the stained glass effect. 7. Adhere Vertigo to white cardstock card base measuring 4 1/4˝ x 5 1/2˝. 8. 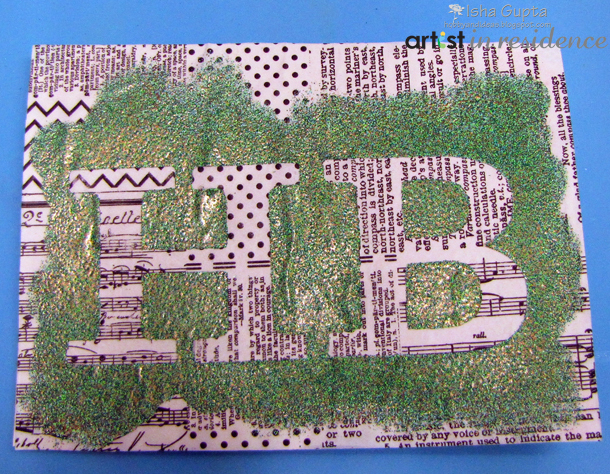 Cut a piece of glitter cardstock in the shape of rolling hills. 9. Stamp sentiment onto the lower portion. 10. Adhere on top of Vertigo with dimensional adhesive. 11. Add decorative trees to finish the card. 1. Cut the black base panel to 4-7/8” x 6-1/8” and adhere to the front of the base card. 2. Cut another black piece 4-1/4” x 5-1/2”. 3. Cut two pieces of the heavy weight vellum to 4-1/4” x 5-1/2”. 4. Spray one of the vellum pieces with Ink Potion No. 9, followed by Danelion irRESISTible Texture Spray followed by Fireworks! in Cantaloupe, touch of Pear Tart, and a good overlay of Tangelo. Dab with a paper towel very lightly to pick up any puddles and allow to dry. TIP: Spraying the paper with Ink Potion No. 9 minimizes the curl of the vellum when you spray with the Fireworks! and irRESISTible Craft Spray. 5. Emboss the second piece of vellum with the Elliana Detail Plate. 6. Adhere the embossed vellum onto the black card top panel. 7. Die-cut the colored vellum piece (back-side of vellum face up and the colored side closest to the metal die) and the black piece with the Elliana Background die. 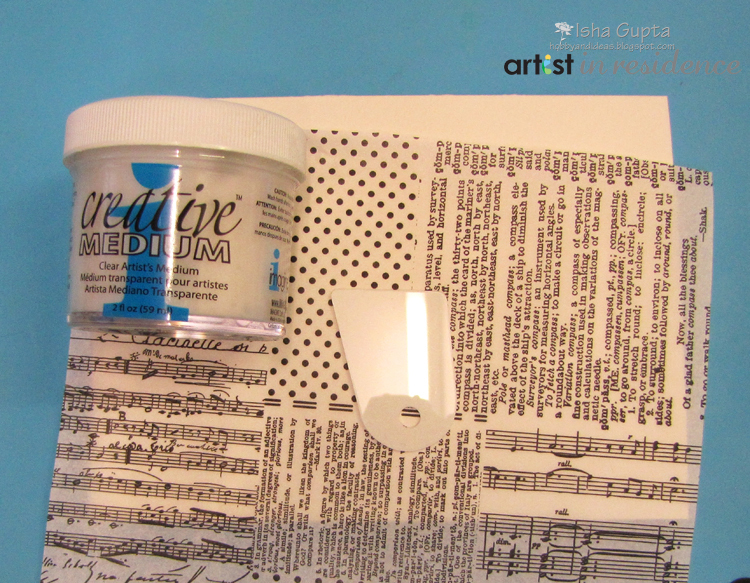 Before removing the steel die from the vellum piece, tape the backside with removable tape so the pieces stay intact; make sure the tape strips stick out from both sides to act like handles when you remove the vellum from the die. 8. Adhere the individual vellum die pieces onto the embossed vellum base in the appropriate spots. If you keep the pieces intact with the low-tack removable tape, it will make finding the appropriate pieces much easier. If you didn’t keep the pieces taped together and you enjoy putting puzzles together, this won’t be a problem. ￼9. Spray colored vellum piece on the left, white vellum piece embossed with Elliana Detail Plate on right. 10. After the individual pieces are attached, emboss the black overlay die cut with the Lattice embossing folder. 12. Cut a small piece of black card stock 1-3/16” x 3-3/8”. 13. With a micro hole punch, make a hole on each side of ths piece approximately 3/16”from each side to thread the Mizuhiki cord. 14. Die-cut 2 sets of the Cirque Alphabet Tags with the copper mirrircard. Use one ‘B’ and two ‘O’s’ to spell ‘BOO’. 15. Hang the letters from the Mizuhuki paper cord on the small black piece and secure each letter on the backside with a mini Zot. 16. Secure the paper cord on the backside with tape. 17. Adhere the small piece at an angle on the left upper part of the card top. 18. Tie a small bow with the Midori ribbon and adhere with a Zot. Debbie is here today to share with you a simple project using the irRESISTible Pico Embellisher in Wedding Dress to add details to card. Cut/score black cardstock to finished A2 size (4¼˝ x 5½˝) for card base. Trim printed background layer paper to 4˝ x 5¼˝; adhere to card base. Die cut pumpkin image from white cardstock. Adhere die cut to the card base. Stamp sentiment with Memento Luxe Tuxedo Black. Create a swirl pattern of fine dots using the Pico Embellisher in Wedding Dress. Note: Thoroughly shake the bottle before using. Practice making dots on a piece of scrap paper to avoid air bubbles. Fill in the small leaf openings with the Pico Embellisher; allow to dry completely. Don’t forget – Round 1 submissions for the 2015 Artist In Residence Call are due TODAY by 11:59pm Pacific Standard Time. To review the entire 2015 Call For Artists please visit the complete details here. Welcome to a crafting extravaganza all week here on the IMAGINE Crafts Blog, where we’re excited to share with you amazing projects everyday created by our own Artists In Residence along with the Design Team Members of Authentique Paper and May Arts Ribbon. There’s more inspiration to be found on the Authentique Paper and May Arts blogs! Simply visit these blogs to view the projects created by those company’s design teams and to view the other prizes available. All three participating companies in this week’s Blog Hop will all be giving away 3 prize packages for leaving comments on the featured blog posts. Each day will we feature projects created by the artists from IMAGINE Crafts, Authentique Paper and May Arts. Simply visit their blogs and leave a comment on each post by midnight PST September 27th. We ‘ll randomly select three different blogs from the seven days, then randomly draw one commenter from each blog as the winner.